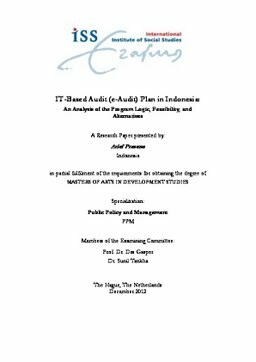 The paper’s aim is to criticize the implementation of the e-Audit project, which is being implemented by Indonesian Audit Board (BPK). It explores the condition why e-audit is should not be implemented in this current stage by assessing the condition of e-government progress, the relation among state audit institution, and the e-audit project itself. It explains all aspects of those conditions. A comparative study to the Netherlands Court of Audit (NCA) was performed to look at ‘how do they work’. NCA is a perfect example of a mature audit institution that bringing a principle of harmonization among internal and external audit institution relationship. The contribution of this research, an analysis of project design which is important for the project that currently still in the progress, leading to lesson learned as well as recommendation.